Who in the world is Nazir Kashmiri? Does anybody have a photo of him? Or screen cap? Or ANYTHING? He is in every single Hindi film I have ever seen. And I have no clue who he is! I must know! I’m losing sleep over it. I can’t afford to lose my beauty sleep. Posted on October 7, 2009 at 8:20 pm in Hindi movies	| RSS feed You can skip to the end and leave a reply. Tags: Who in the world is Nazir Kashmiri? Working since 1947 .. wow.. and no image available. Bollywood is unkind to its people really ! I know!!!! His name is ALWAYS in the credits, but always in the “bit player” ones…never as one of the main roles. Could he possibly be the guy on the left in this photo? I got this through Google Images, which led me to the “Ek Saal” post on the Old is Gold blog, but even there the identity is uncertain. Let’s hope this is the right guy! We will have to hope Bollyviewer herself shows up here and lets us know why she thinks it may be him (I had seen that post, but she doesn’t seem too certain herself). Wow! Never heard of him! You have an eagle’s eye for such details! Now you will see his name EVERYWHERE. For a long time I thought Shivraj was Nazir Kashmiri… I wonder if it is the guy in that photo from Bollyviewer’s blog. Now I’m getting fidgety too; I’ve got to know! If you and Bollyviewer can’t tell me, then I may be doomed! Honestly the man has to have been in 500 movies! It could be the one sy has posted. I have seen this gentleman so often in movies. I looked there already ;-) Some of them have been in just about every film I’ve seen! None of them are named Nazir Kashmiri though! Dont think this will help either. Some more photographs – some rare and some, not so much. I think he must have been young in his films of 60s. According to the list of films, after his first film in 1947 the next one was in 1957. I’m guessing that he must have been a child artiste in 1947 and then a young man. His last film in 1982 makes him about 50+ then. At the most 60+. If you are going according to imdb’s list of his films, it is not very accurate at all. He is in EVERY FILM I’ve seen between 1947 and 1967 anyway. Thanks to your OCD regarding bit actors, according to IMDB, the man has had a upsurge in popularity by 390%. He must be smiling somewhere. Oh dear!!! Now I’m hooked!!! It’s the same as when a word is on the tip of your tongue and you can’t say it. Hours and hours of watching Kohinoor, Chaudvin ka chaand (I love both anyway) and I don’t know who has my Amrapali (I’ve leant it out) so I hope these two will provide some clue. Will get back in a couple of days, if no one has come up with the answer by then. I guess I will have to live in hope that maybe one of his relatives or family friends finds this and obliges us with a photo or something! I have often wondered wondered about him. 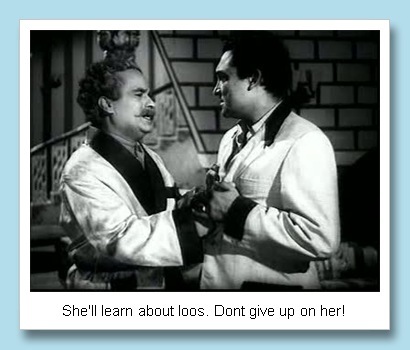 Romeo and Juliet directed by Akhtar Hussain in 1947 starred Anwar Hussain, Nazir Kashmiri and Nargis. We assume that Anwar and Nazir were Romeo and Juliet respectively as Nargis was Anwar’s real life sister. No body seems to have a clue. 1947 was a bit late to be having a male play the female! Although I’m loving the idea of Anwar and Nazir being the lead pair :) It’s probably more likely that Nargis was Juliet and Nazir was Romeo and maybe Anwar was Mercutio or something. Would be good to get my hands on it though if he was that high up on the credits list, I might be able to figure out who he is! It is a mystery for sure. So do you know who he is?! it was another actor, John Bailey, playing Romeo. He was a British actor. It must have been a collaboration between Indian and British film makers. Most of these sites depend on programming – bots – for content, so usually get obscure stuff wrong. A few questions in the right quarters (old-movie buffs) havent elicited anything useful. So the only way is to watch movies where he is credited in the cast and then look for that one unidentified character actor who is common in all. To that end – my movie watching is on! Hopefully Nazir Kashmiri’s true identity will be revealed. I don’t think 2 days that I had given myself, to watch Kohinoor and chaudvin ka chaand would help. I’m wondering if one of Waheeda Rehamn’s brothers in Chaudvin ka chaand could be him. I’m going to keep him in mind and watch out for him in other films. Keep me posted on your progress! I will keep trying to figure it out too! Has this mystery been solved ? A few questions in the right quarters (old-movie buffs) havent elicited anything useful. So the only way is to watch movies where he is credited in the cast and then look for that one unidentified character actor who is common in all.